Are you using your garage space in Toronto to store tires? This is the season when most people move seasonal car tires into and out of storage. Toronto car dealers charge an incredibly high fee to store tires for six months, but at Jiffy Self-Storage, we have the smarter solution for thrifty Toronto consumers looking for a cheap Toronto solution for storing seasonal tires. Rent a 25 sqft (5ft x 5ft x 9ft high) unit from Jiffy Toronto to store your winter tires plus other seasonal stuff inside one of our climate controlled storage spaces. You may ask yourself what difference does a proper storage space make for your tires. Well, tires that aren’t properly kept away can suffer a range of problems. Here are five quick and easy tire-storage tips and why they’re important. Taking a vehicle’s weight off its tires. A vehicle kept stationary for a season’s worth of time with its tires kept on can hurt the rubber, as the weight can create troublesome pressure spots. Avoiding harmful direct sunlight. The sun emits UV rays and radiant heat that take a toll on tire rubber, heating – and damaging – its surface. Clean before storage. Tires build up dust, dirt and grime with use, and from idling in a garage. Before tucking them away into storage, give your tires a thorough cleaning using soap and water, and dry them off completely. Store in bags. Don’t let your tires take a much-needed storage break without ensuring they’re properly bagged. You’ll need an airtight bag – such as a garden or lawn bag – to put them in. One important thing to keep in mind is that as much air and moisture as possible (some people even vacuum the air out of the bag). The result is the tires will be kept in a contained atmosphere that will guard against oil evaporation. Place them in storage on their sides. 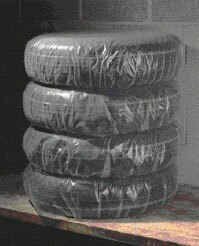 Keeping tires stored upright with no support can result in flat spots from weight pressure being put on a specific spot. Spending six months upright can be problematic. Instead, keep your tires placed flat on the ground, stacked one on top of another. At Jiffy, our standard storage locker has more than enough room to house stacked tires. Besides storing tires that free up space in you home or garage, many of our Toronto storage clients use their storage space to store seasonal items. In summer, our Toronto storage clients use their Jiffy Self Storage space to not only store their winter tires, but store leisure items like toboggans, roof racks and roof storage, snow skis, snow boards, snow shoes, snow mobile jackets, helmets, snow-blowers and any other winter seasonal stuff in their Jiffy Toronto Storage locker. Sorry, no snow men allowed! In winter, seasonal things that will take up room in our storage clients garage storage spaces are moved into their Toronto storage locker. Items that for sure would clog up a garage or a balcony do a lot better in a climate controlled storage space. Take the example of an active family that likes to hike, camp, water ski and more. Naturally, they can store their stuff at Jiffy, as well as storing their boat in our gated and fenced in lot as well. So for just a few bucks a day, a lot of stuff that clutters a home or a garage can be stored at a self storage company like Jiffy Self Storage. More families are starting to realize that using a home for storage is a very expensive proposition, especially in Toronto GTA where the average home sells for $450,000. Therefore, if a home space being used for storing is the equivalent of 100 sqft that means that the space that is being used is worth $25,000. Why would anyone want to store this stuff in such valuable space? Start taking back your Toronto storage space and let your family enjoy their new found space to the max. Let Jiffy Self Storage look after your stuff for just about $3.00 per day. That type of logic is making a lot of sense to more Toronto families living in expensive Toronto GTA homes, apartments and condos. Really an informative post, thanks for sharing. A storage place brings several benefits and we can maximize it for storing seasonal items or other possessions hard to throw away. There are lots of storage units available now a days, I suggest that it is our responsibility to look for a safe, secure and affordable storage unit. 25k/100sq. ft. I think is relative to the location but definitely agreed! Homes aren’t meant to be used for storage they’re meant to be comforting and beautiful! Who want’s to come home to a room full of boxes and tires? i really enjoyed reading this article. really informative. thanks for sharing this information with us. So at $3 per day (minimum) plus tax $3.39 x 365 = $1237.35 a year to store tires? With zero installation service or delivery / pickup service? I hope it comes with a free moth ball.